Enterprise implementations typically include a mix of software technology and data sources carefully selected to satisfy specific operational business needs. The ArcGIS platform includes an integrated mix of software developed to satisfy a full range of GIS user requirements. All of these components are designed as a system to work together within an integrated enterprise GIS environment. This is the big picture of what ArcGIS has to offer in building an enterprise GIS. ArcGIS is the overall platform, and the components of this platform work together to satisfy a variety of specific business needs. An overview of the ArcGIS platform component architecture. Desktop GIS: The ArcGIS for Desktop family is developed from a common set of ArcGIS object relational executables, delivering a fully integrated set of scalable desktop product offerings. Lighter desktop applications include ArcReader, ArcGIS Engine, and ArcGIS Runtime focused applications. ArcGIS Pro makes the GIS functionality you most often use easy to access so you can get your work done faster without a big learning curve. 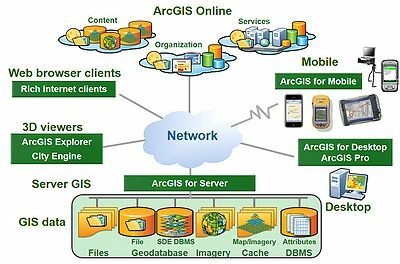 Server GIS: ArcGIS for Server provides technology for publishing GIS services that can be consumed by ArcGIS for Desktop, mobile GIS, and standard web browsers. ArcGIS for Server has grown over the last few releases to include imagery, SDE geodatabase access, and distributed geodatabase management within a common set of ArcGIS executables. GIS Data: Data management solutions are provided for file data sources, geodatabase, imagery, and pre-processed map cache. Files include GIS shapefile and file geodatabase formats. SDE geodatabase is used for multi-user GIS data maintenance operations. Imagery is fully integrated with ArcGIS since the ArcGIS 10 release. A map cache is a file share that delivers preprocessed map tiles as high-performance basemaps for map display. 3D Viewers: ArcGIS for Desktop extensions include 3D Analyst and CityEngine for 3D modeling and data management. A free ArcGIS Explorer download can be used as a light desktop 3D viewer. 3D ArcScene data packages shared from CityEngine can be viewed with the free CityEngine Web viewer. ArcGIS for Server also delivers KML services for 3D overlay with Google Earth and Microsoft Virtual Earth web clients. Mobile GIS: Mobile devices extend GIS to include mobile operations and use by the general public. ArcPad is an optimum application used by several Esri vendors for data-collection workflows. ArcGIS for Windows Mobile connects mobile operations into enterprise GIS workflows. ArcGIS on smartphone devices (iOS, Android, and Windows Phone platforms) delivers GIS for the general public. 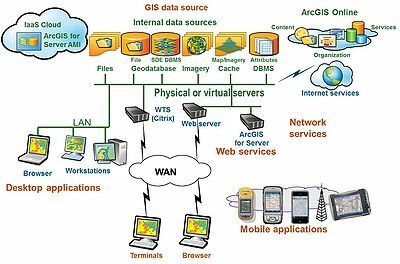 GIS Web Services: GIS web services support a variety of managed, hosted, and shared GIS online services. Portal for ArcGIS is a fundamental part of the ArcGIS platform, delivering a self-service content management and information sharing framework for empowering enterprise operations throughout the organization. A variety of software as a service (SaaS) mapping solutions are provided, including subscription services for publishing named user map services in the cloud. Selecting the right software and the most effective deployment architecture is very important. ArcGIS technology provides many alternative architecture solutions and a wide variety of software, all designed to support specific user workflow needs as shown in the figure below. GIS enterprise solutions often include a mix of software technology and data sources carefully selected to satisfy specific operational business needs. What are the best data sources? 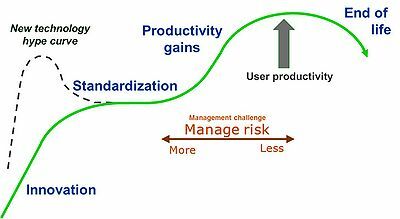 What user workflows should be supported by GIS desktop applications? What can be supported by cost-effective web services? What business functions should be supported by network services? Where will mobile applications improve business operations? Reviewing the available technology alternatives and how each performs and scales within your user environment can provide critical information needed to make the right technology decisions. Operations can be supported on local disk or CD-ROM, DVD-ROM, shared file servers, geodatabase servers, imagery, preprocessed map cache, or web data sources. Cached map services provide the highest performance and scalability. Local data sources support high-performance productivity requirements with minimum network latency. Remote web services allow connection to a variety of published data sources, with the drawback of potential bandwidth congestion and slower performance. The highest level of functionality and productivity is provided by local ArcGIS for Desktop applications. Professional GIS users will be more productive with the ArcGIS for Desktop software. Desktop applications are supported on user workstations or hosted on central Windows Terminal Server farms. ArcGIS for Server technologies provide efficient support for a wide variety of more focused GIS user workflows. Provide an efficient way to share data to support remote client workflows. Provide the most efficient way to publish standard map information products. A cost-effective way to leverage GIS resources to support users throughout the organization and associated user communities. A growing number of GIS operations are supported by more loosely connected mobile GIS solutions. ArcGIS technology supports workflow operations that include disconnected editing and remote wireless operations. Disconnected architecture solutions can significantly reduce infrastructure costs and improve user productivity for many field operations. Most enterprise GIS solutions include a mix of ArcGIS technology tailored to meet specific business needs. ArcGIS technology works together as an integrated system environment, with each component optimized for optimum user productivity. Software and hardware product life cycles are getting shorter as technology improves more rapidly each year. Software technology cycle showing how the evolution of a specific software product contributes to effective GIS operations. Complete a design analysis before your buy. Bottom line: Selecting the proper software and architecture deployment strategy can have a significant impact on user workflow performance, system administration, user support, and infrastructure requirements.